Custom window treatments are desired by clients because they want a unique look or have a very challenging shape or size. 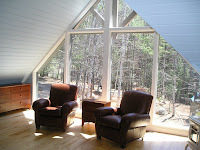 When you have a shaped window it is virtually impossible to find something "off the rack" to meet your needs. In this example there is a wall of glass. Walls of glass are great, but if it is your bedroom, it isn't so cozy, especially at night. At nighttime, there is no privacy so there needed to be something. 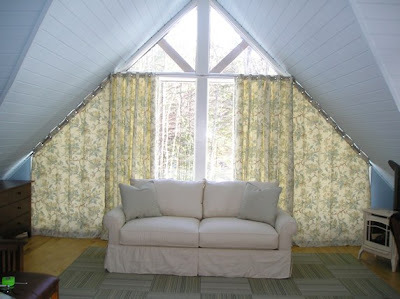 The drapery panel is the right choice for this large space. The fabric added much needed softness to the hard surfaces. I measured and sketched the shape. This allowed me to convey the exact sizes and angles to my fabricators fo r the custom rod and panels. I chose to use grommets because they controlled the angled panels. 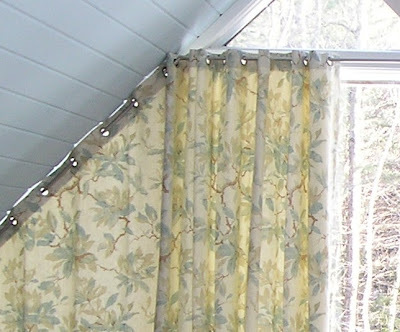 Drapery panels serve many purposes: decoration, softness, privacy, light control, UV protection and insulation.